1. 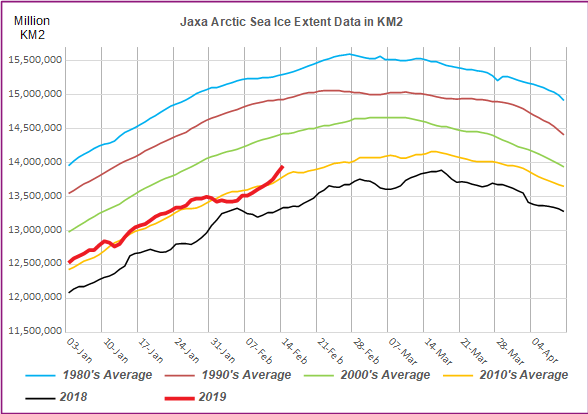 What will the maximum sea ice extent be in 2019, in millions of km2, according to the ADS values? It's been a while since I set up one of these, so how about a new one as we look towards 2019? The last 4 years have been the 4 lowest on record. Will we follow course or buck the trend next year? The poll will remain open until the end of the month. is that 13.89 figure what it was 'now' when you wrote the post, or the maximum earlier this year? It was the maximum for this year, back in March. Oh, Ok thanks. 14 million km2 then. I think gains are going to be harder to come by now. Hudson, Chukchi and Baffin are iced over and SSTs in Barents are still well above average. Hard to believe the ice has barely touched the northern coast of Svalbard and we're almost into January. 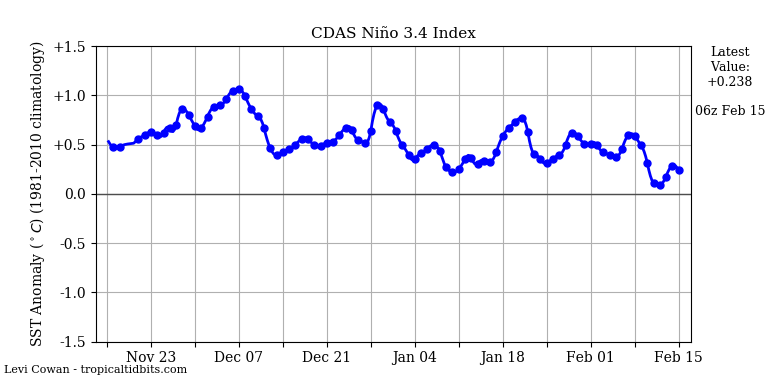 I feel that sea ice max will be very similar to the last few years. I have been looking at past archived Gif's looking for Sea Ice for Asia and Europe and it shows that the Sea Ice increase for 2018 is ahead of 2016 but slightly behind 2015. I look at the gif's for December 31st 2016 and December 31st 2015. I got the information from the NOAA website. Extent has boomed in recent days, from 2nd lowest to 7th lowest for the date. With that, it has now entered the first bracket in our options, at 12.52 million km2. Oops my bad, you're absolutely right, it was the Antarctic thread. There's so many ice threads I got the wrong one, as I didnt read this properly when rushing on my phone! Into the 3rd bracket now, 13.1 million km2, hovering around 6th or 7th lowest for the date. Is there any way to see what you voted? I forgot. Unfortunately, I set the votes to private. When I've had open voting in the past, some people complained. Though that's going years back so maybe things have changed!? Next poll I'll leave open so we can see what everyone voted for. Sea ice growth booming in recent days once again, and now up to 13.954 million km2, and above the maxima of 2015, 2017 and 2018. No new records this time! 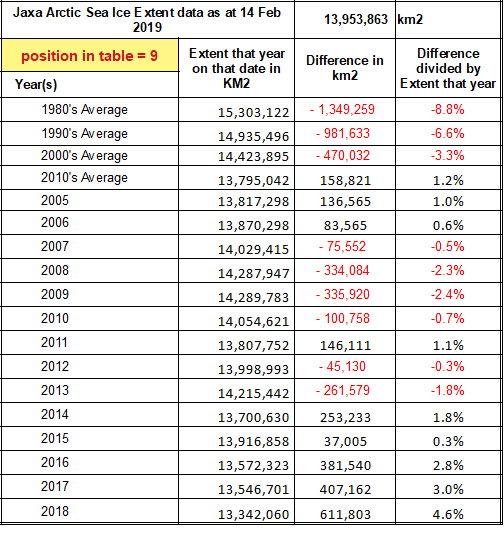 It has moved up to 9th lowest now (for the date) and is above the 2010's average and is approaching the average for the 2000's being also above those of 2005, 2011 and 2006, and also closing in on 2007 and 2010.. Thanks to the ASIF for the above charts. 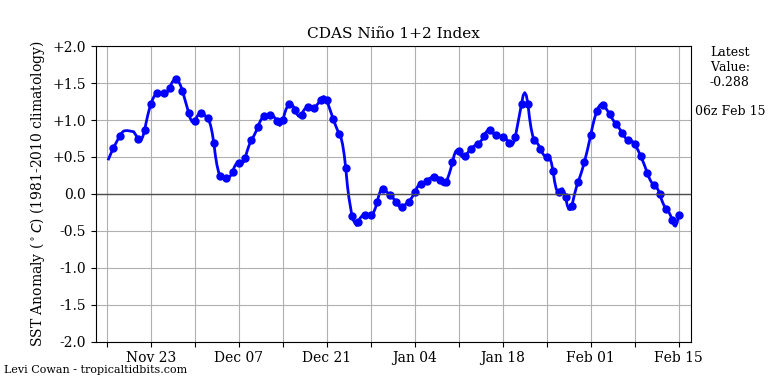 Also of note is the sudden reversal in the ENSO SST data in the week following the NASAA(NCDC) announcement that the El Nino is now official up to the 7th of February. Think they can show us a thing or two in Just in Time analysis!